A charming (and silky) combo. Give our fluffiest gift set to those you love! 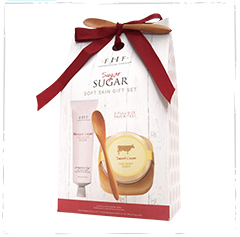 This box gift set includes our customer-favorite Sweet Cream Fine Body Scrub and Fluffy Bunny® Shea Butter Hand Cream, housed in a cute carrying case with bow and wooden spoon. A tubeful of comfort! Our lightest, fluffiest scent will swirl you into a dreamlike state with mint-julep, cream and just a hint of lavender. It's fresh, but uplifting and delicious at the same time. Just like our other shea butter creams, the supple butters and Vitamin E packed Jojoba and Soybean oils calm even the severest of dry skin, without a hint of a greasy feel. Your gift recipient will be 100% silky soft (and dare we say - cuddly!) Plus, this 2 oz. tube loves to travel. Our O-List favorite scrub is a deceivingly serious scrub that rubs and refines your skin into a silky softness you've simply never felt before! Use in the shower or bath tub-- just scoop, rub and scrub in circular motions. 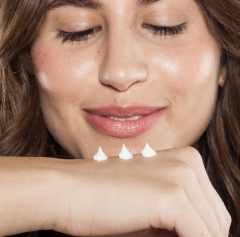 The light sweet cream scent is just heavenly and the fine grains leave skin feeling fresh, smoothed and looking radiant! Perfect for keeping cracked heels at bay. Made from the finest grain fresh sea salt and uniquely formulated around rice bran oil for its exceptionally high amount of vitamin E. Lightweight, non-greasy and so addictively yummy, your gift recipient will keep a jar by every sink and bathtub! FLUFFY BUNNY SHEA BUTTER: Shea Butter, Cocoa Butter, Jojoba Seed Oil, Soybean Oil, Aloe, and Vitamins A & E.
SWEET CREAM SCRUB: Rice Bran Oil and Natural Sea Salt. FLUFFY BUNNY SHEA BUTTER: Softens and soothes dry, chapped skin. Calms many irritations and allergies, including sunburns. Fights wrinkles through deep penetration of vitamins A & E, helping improve elasticity and aiding skin in retaining its own moisture. SWEET CREAM SCRUB: Removes dead skin, providing better penetration of other products. Stimulates renewal of skin texture. FLUFFY BUNNY SHEA BUTTER: Water/Eau, Stearic Acid, Glycerin, Glycine Soja (Soybean) Oil, Glyceryl Stearate SE, Butyrospermum Parkii (Shea Butter), Sorbitol, Cyclopentasiloxane, Theobroma Cacao (Cocoa) Butter, Simmondsia Chinensis (Jojoba) Seed Oil, Aloe Barbadensis Leaf Juice, Organic Cucumis Sativus (Cucumber) Fruit Extract, Cetyl Alcohol, Polysorbate 80, Parfum*, Tocopheryl Acetate, Octyldodecyl Myristate, Potassium Sorbate, Phenoxyethanol, Caprylyl Glycol. *All Farmhouse Fresh fragrances are phthalate-free. SWEET CREAM SCRUB: Sodium Chloride, Water/Eau, Parfum*, Cocamidopropyl Betaine, Polysorbate 20, Glycine Soja (Soybean) Oil, Sea Salt, Oryza Sativa (Rice) Bran Oil, Tocopheryl Acetate. *All FarmHouse Fresh fragrances are phthalate-free. FLUFFY BUNNY SHEA BUTTER: Apply to hands, nails & cuticles any time skin feels dry or tight. 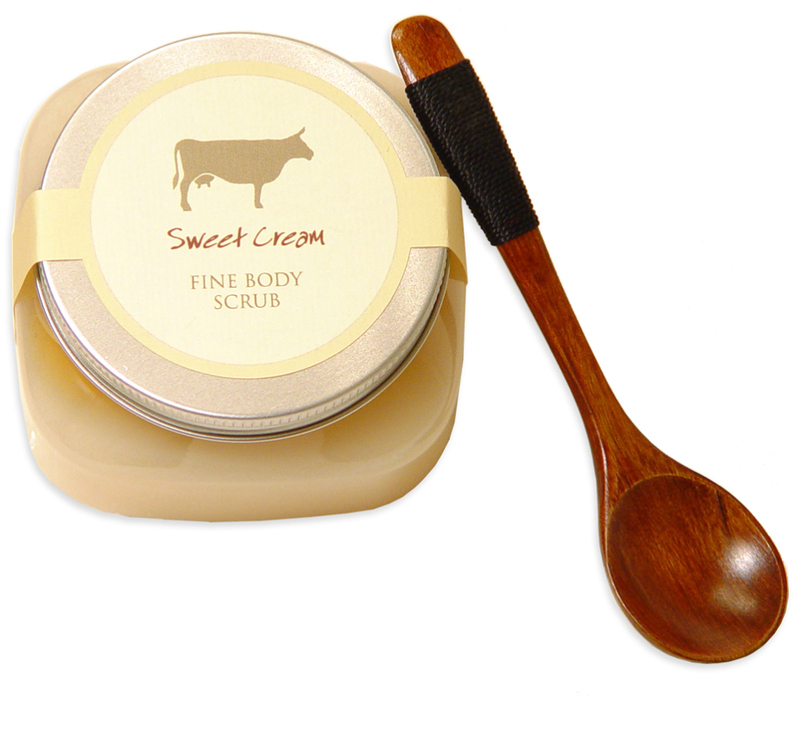 SWEET CREAM SCRUB: Apply in circular motions to wet skin while in the shower or bath. Rinse well. Use two to three times a week.